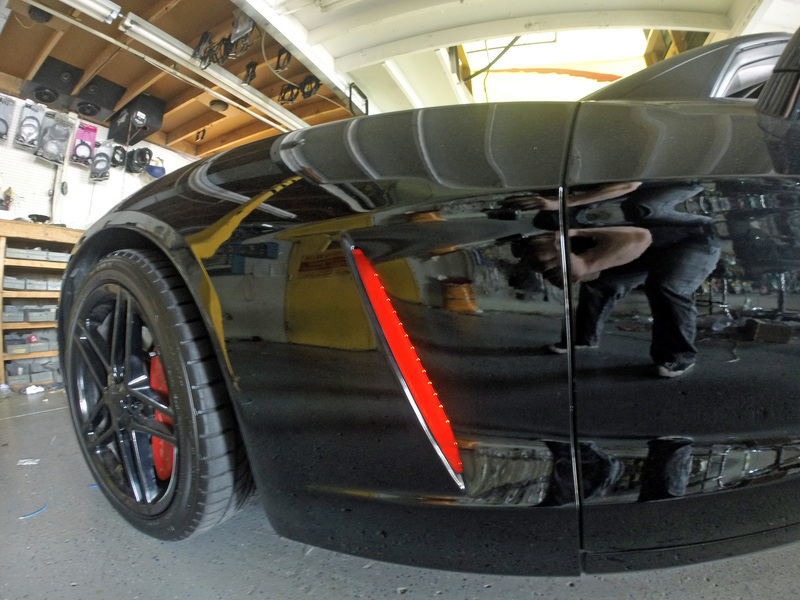 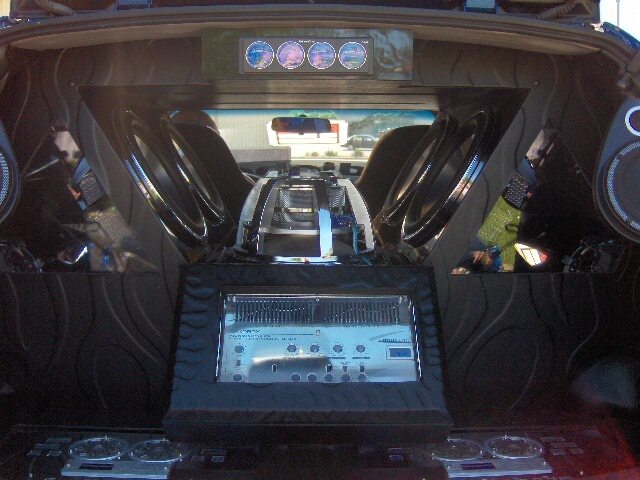 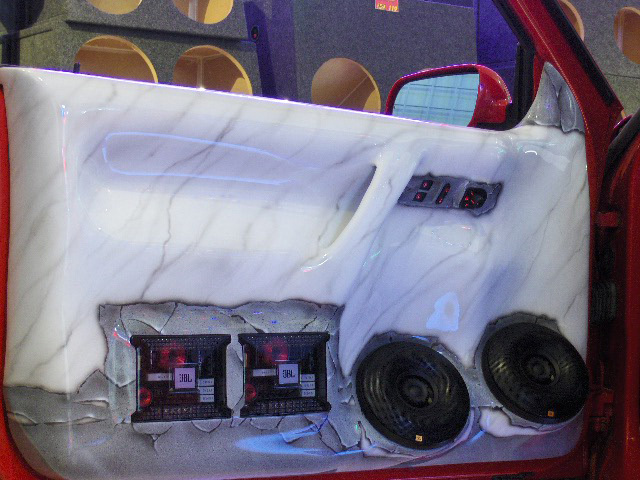 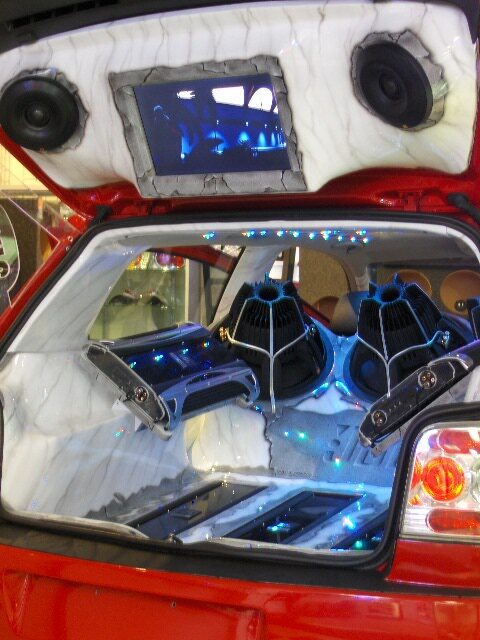 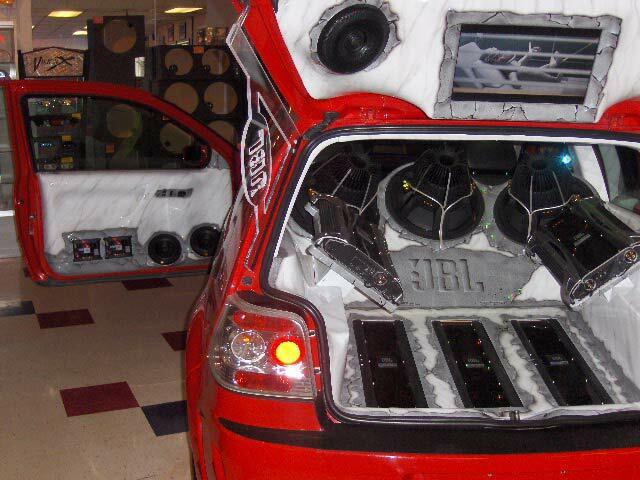 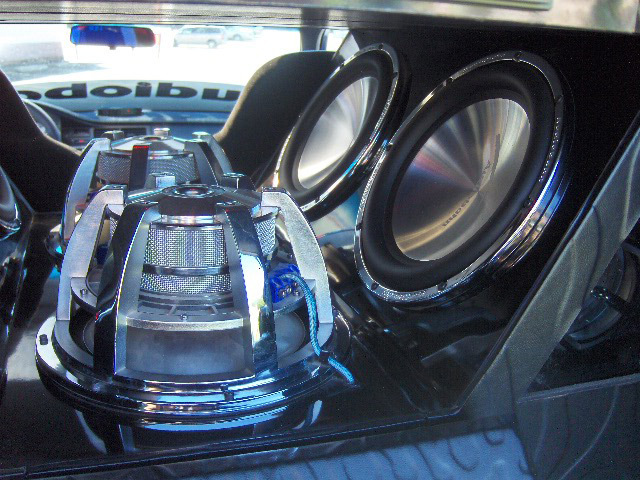 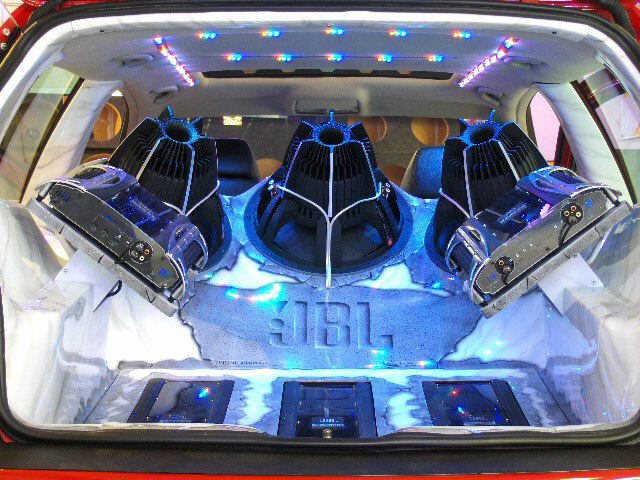 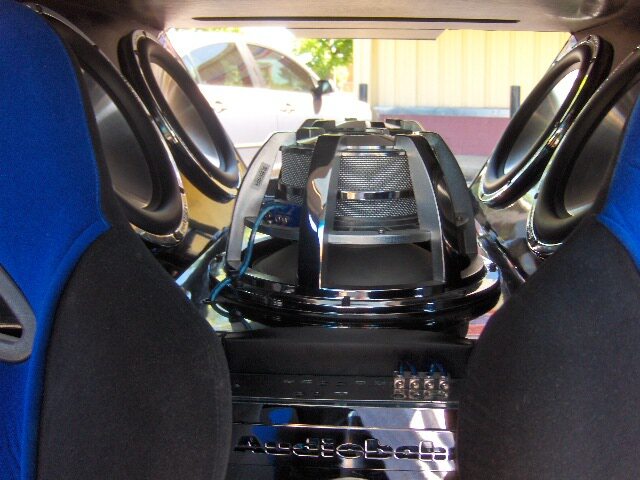 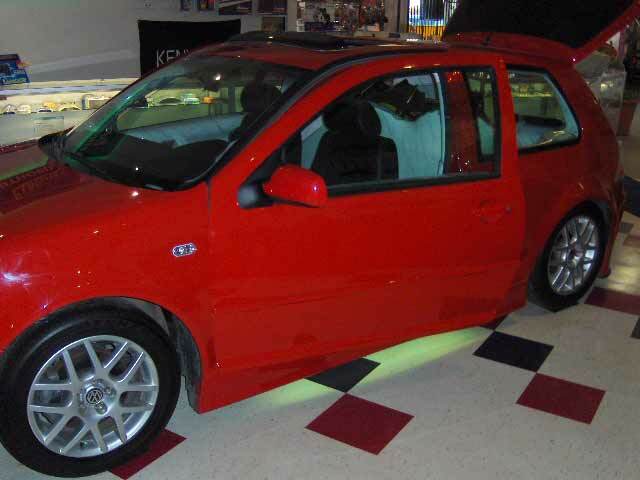 We Do Many Custom Car Audio Installations. 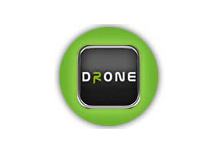 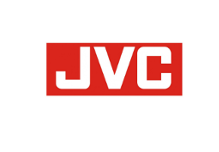 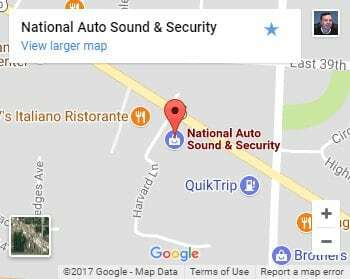 Stop By & Talk with Us Today! 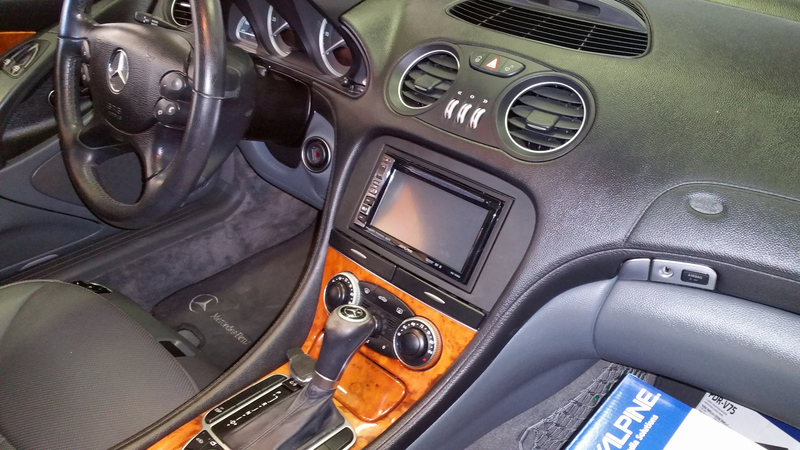 Mercedes SL500 with full Alpine system. 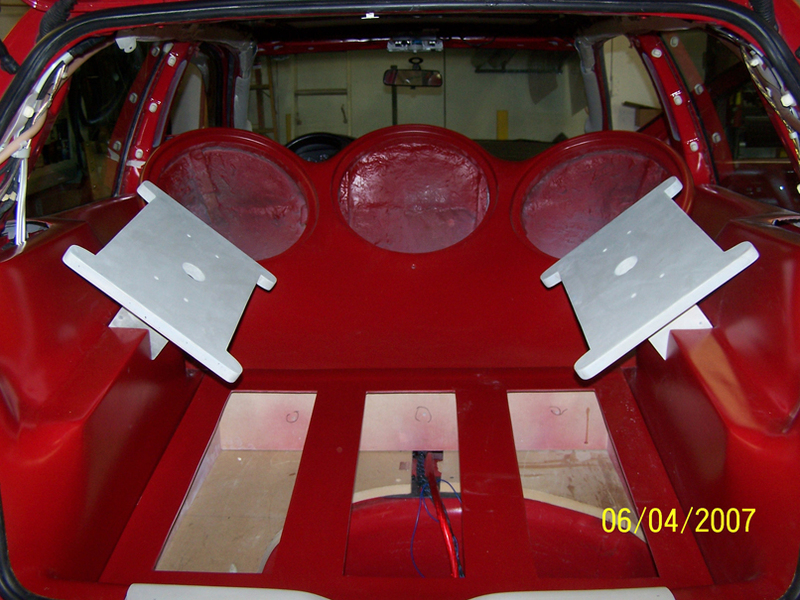 Custom fiberglass underseat enclosure for two Kicker CompRT 10″ subwoofers powered by a Kicker CX6001 amplifier. 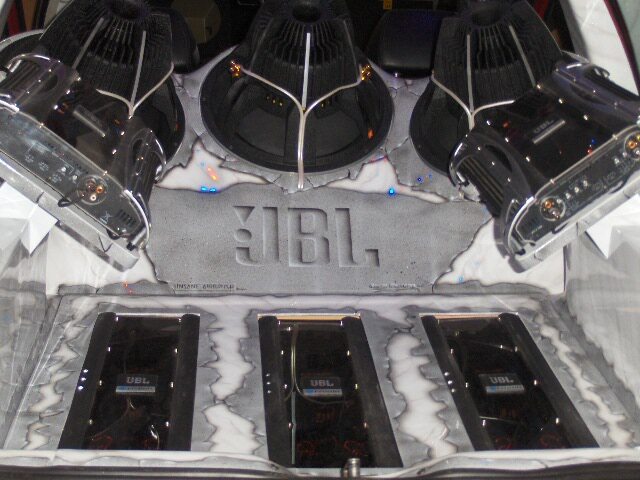 Great bass with little space! 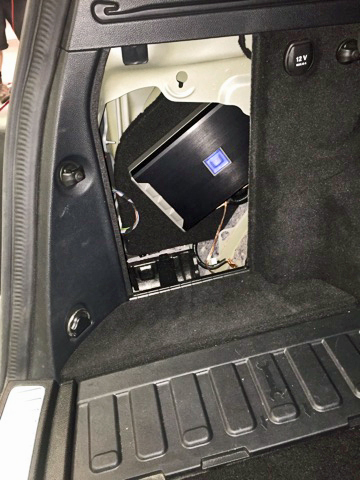 2011 Mercedes Benz GLK350 with rebuilt floor and sunk in subwoofer enclosure in spare tire well with Alpine Type S 12″ subwoofer. 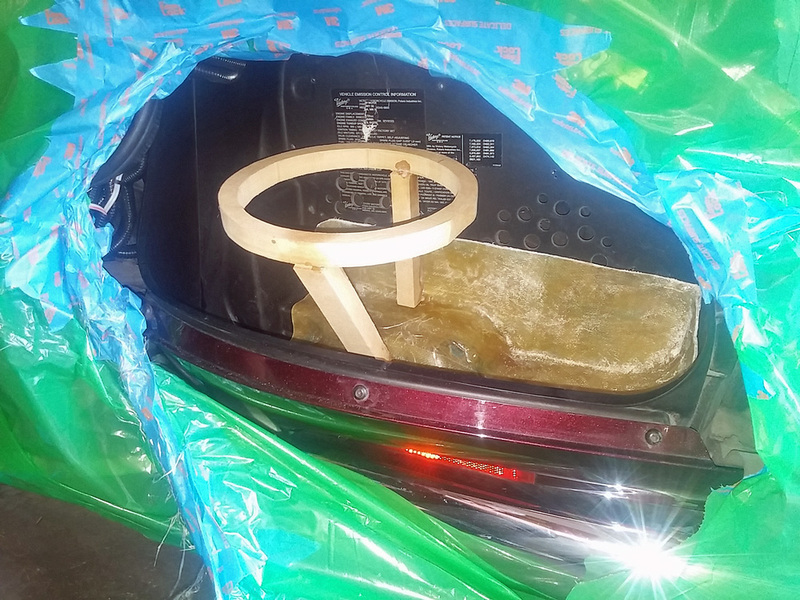 Enclosure allows full usage of stock spare tire if needed. 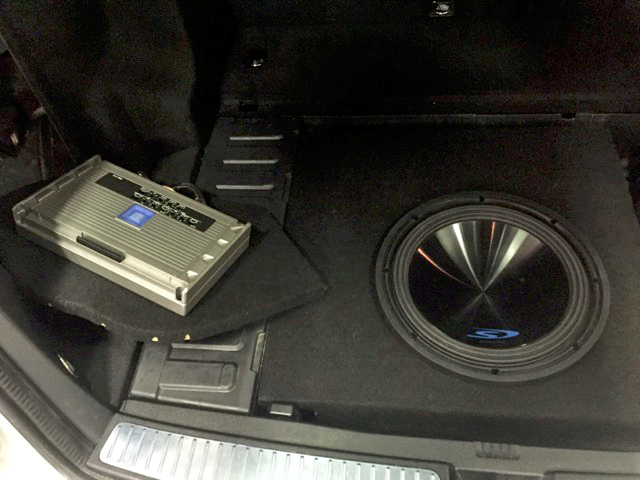 Alpine PDR-V75 five channel amplifier that powers all small speakers in vehicle as well as the Alpine Type S 12″ subwoofer. 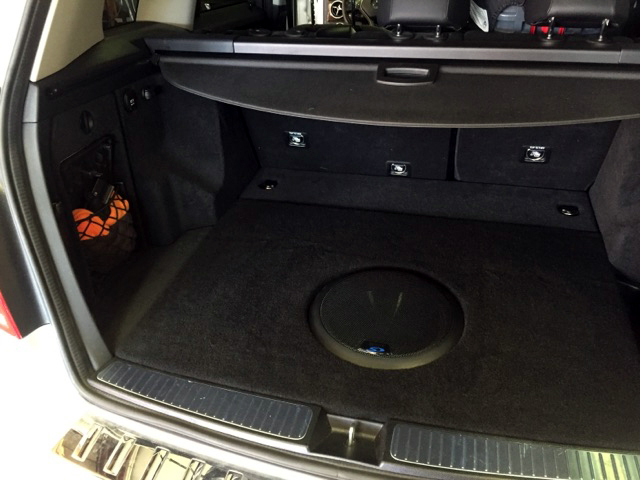 In this picture you can see the removable subwoofer enclosure that fits into stock spare tire. 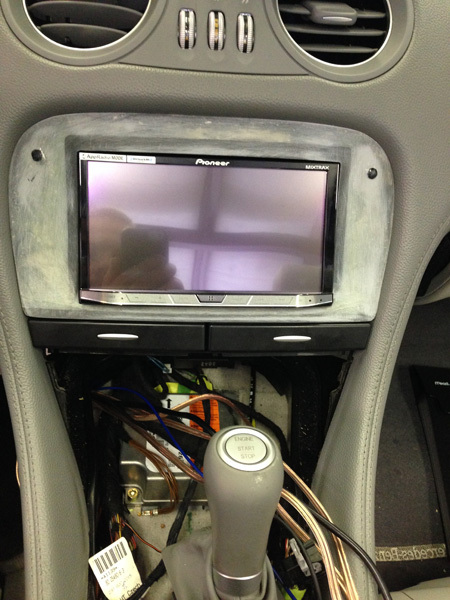 Alpine PDR-V75 five channel amplifier mounted inside rear side panel and normally completely hidden from view. 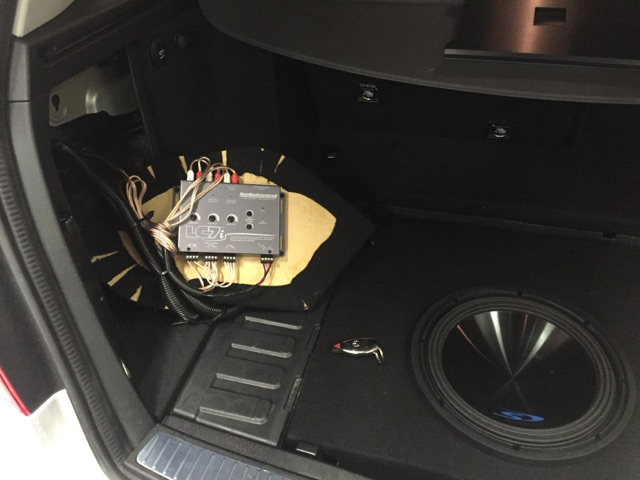 Audiocontrol LC7i processor mounted in rear side panel behind amplifier and normally completely hidden from view. 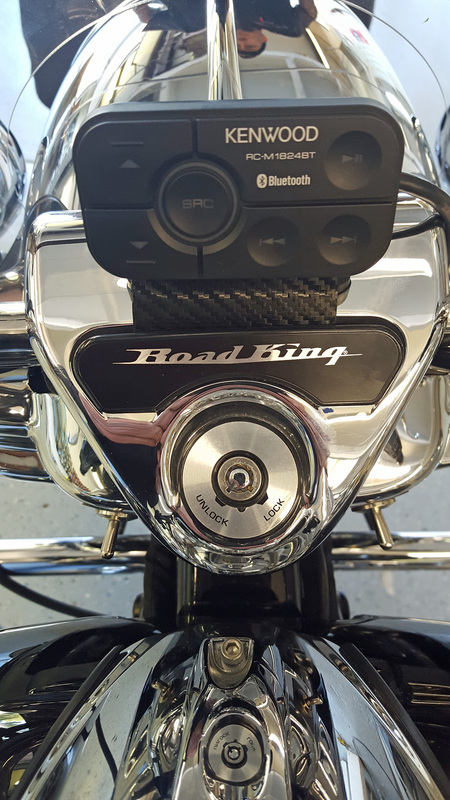 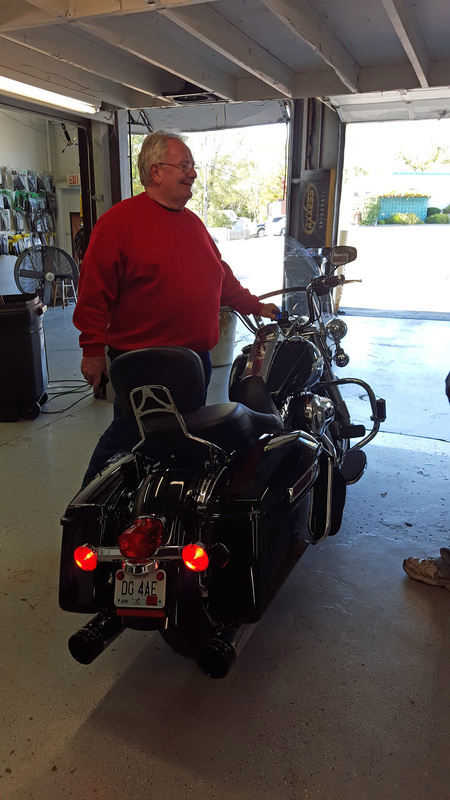 Kenwood bluetooth amplifier and custom mounted a pair of Polk Audio MM 6×9’s in this 2015 Road King. 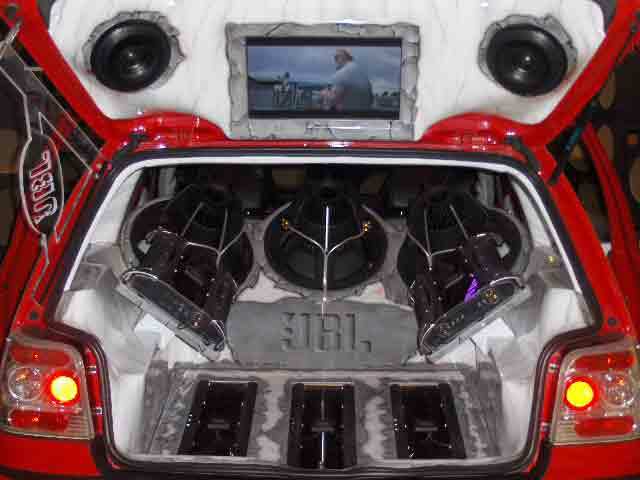 Unbelievable sound and volume almost completely hidden with no radio needed and no exposed speakers or amps. 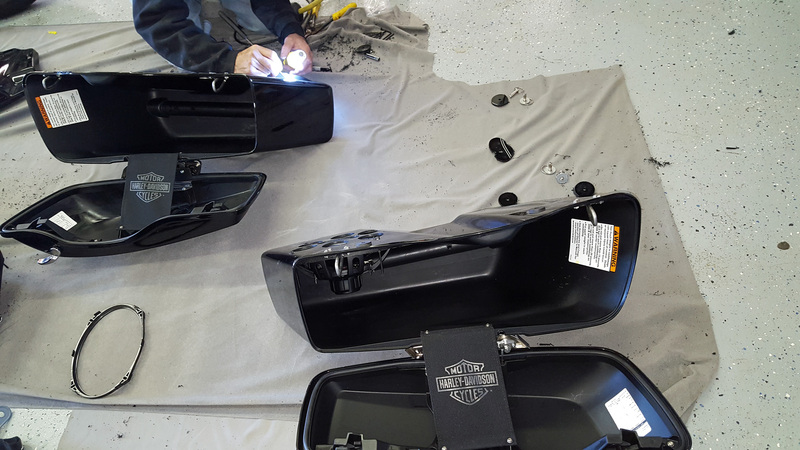 Flush mounting Polk MM 6×9’s installed in the hardbags. 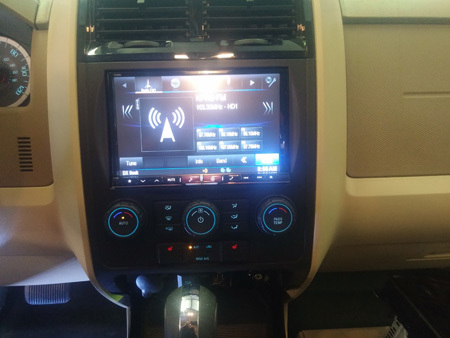 Also, USB input installed as well. 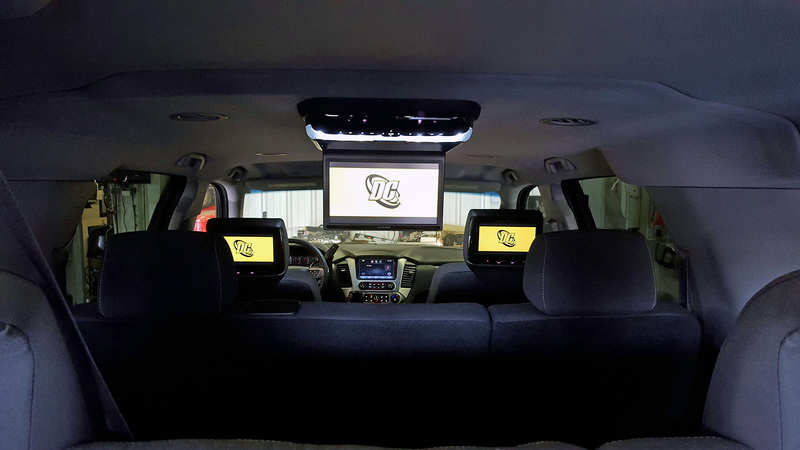 Alpine 10.4″ overhead flipdown video unit plus two Concept 9″ headrest monitors installed in this 2015 Yukon. 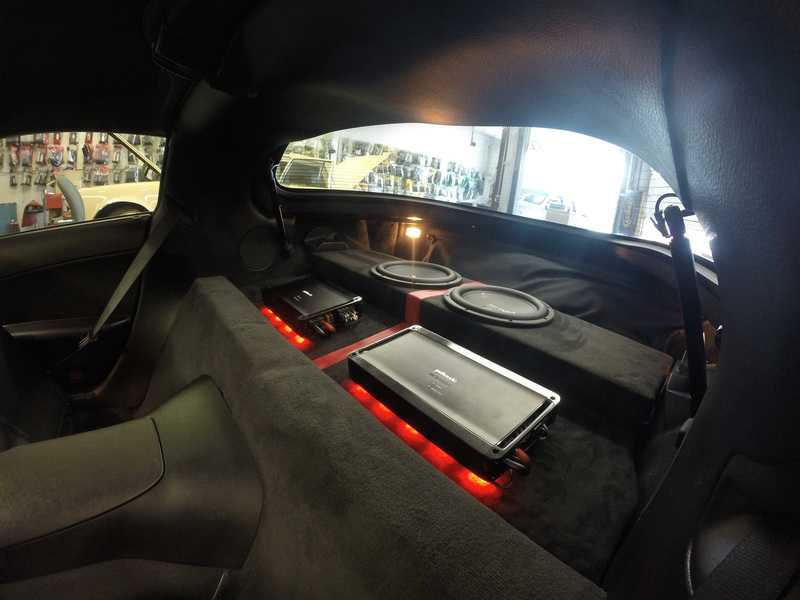 Long trips are about to get a whole lot better for this family. 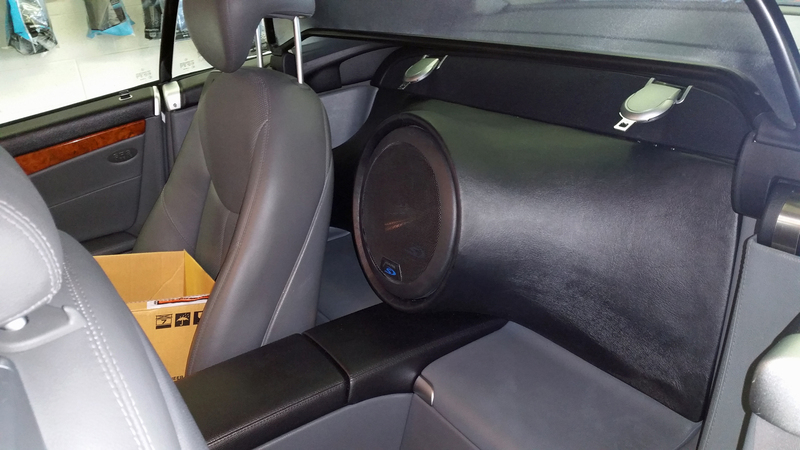 Custom fiberglass enclosure for 8″ woofer. 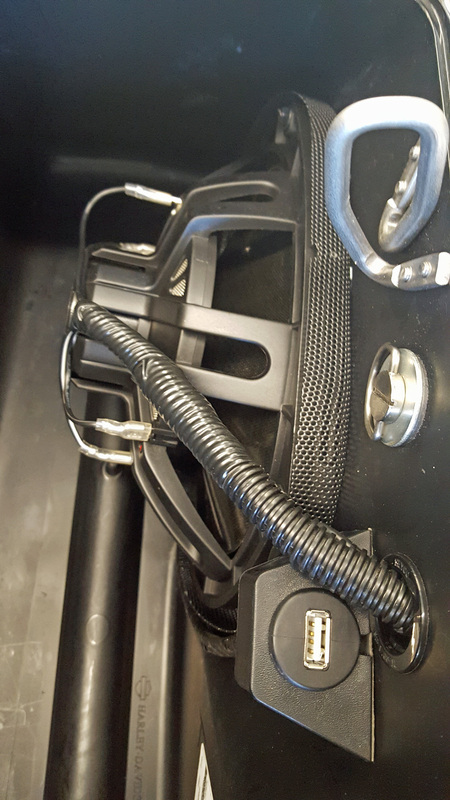 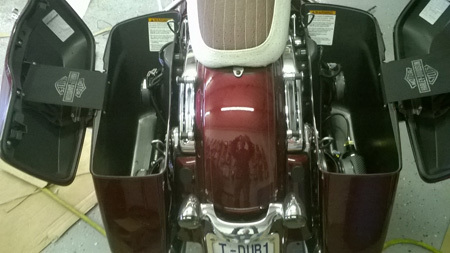 Mounted inside of Victory Vision hard saddlebags. 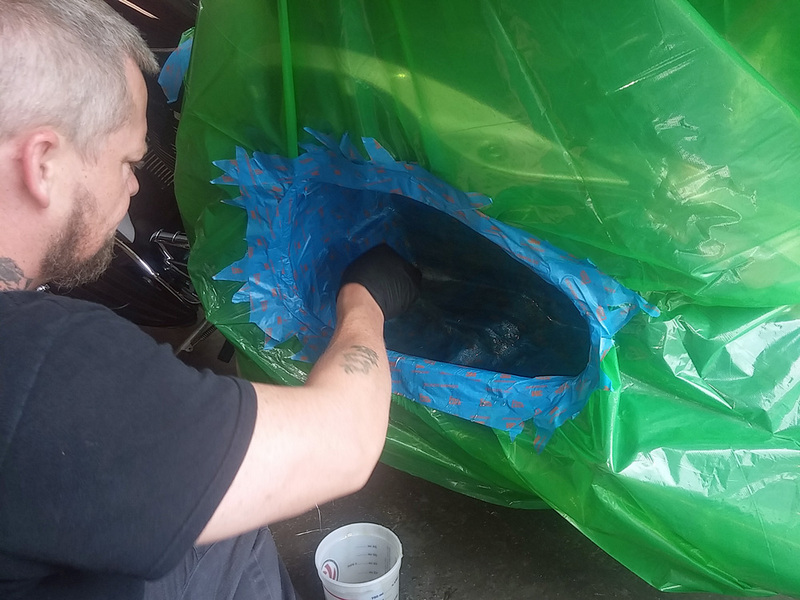 Masking off rear hard bag and getting it ready for laying fiberglass. 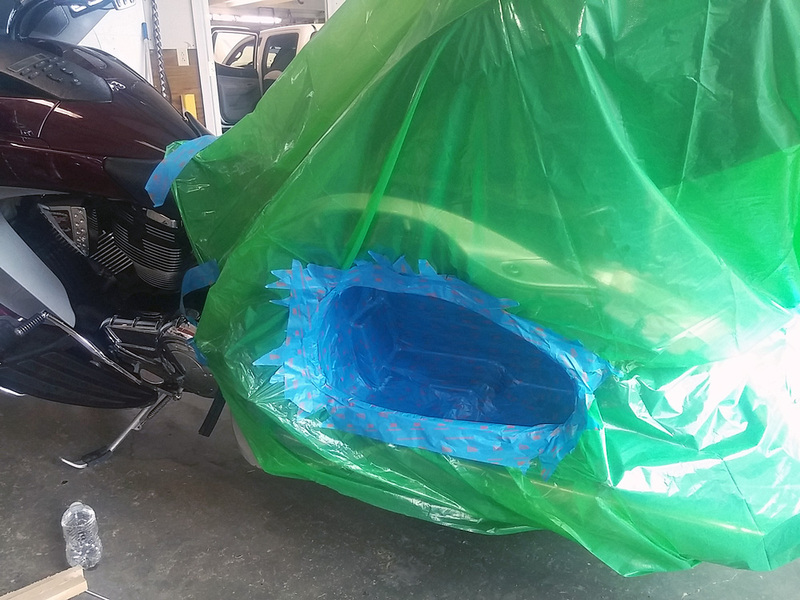 Laying fiberglass for the lower and back edge of enclosure. 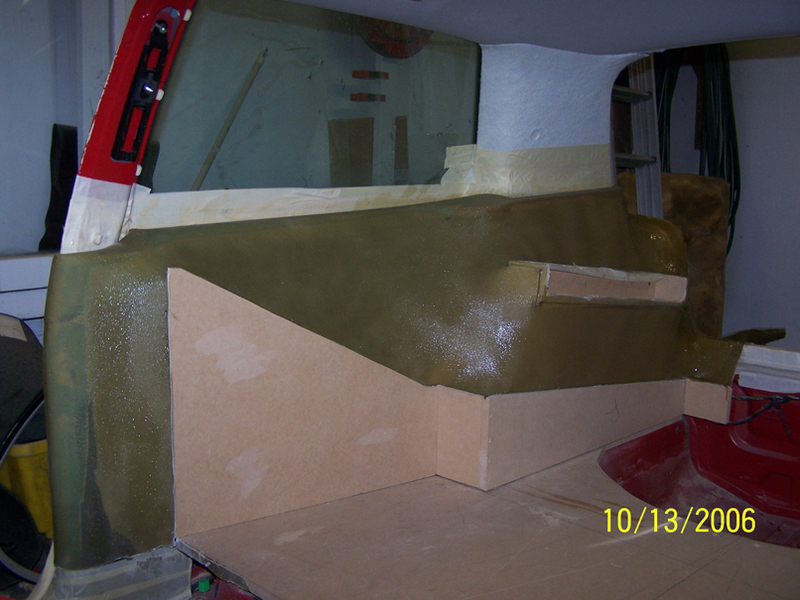 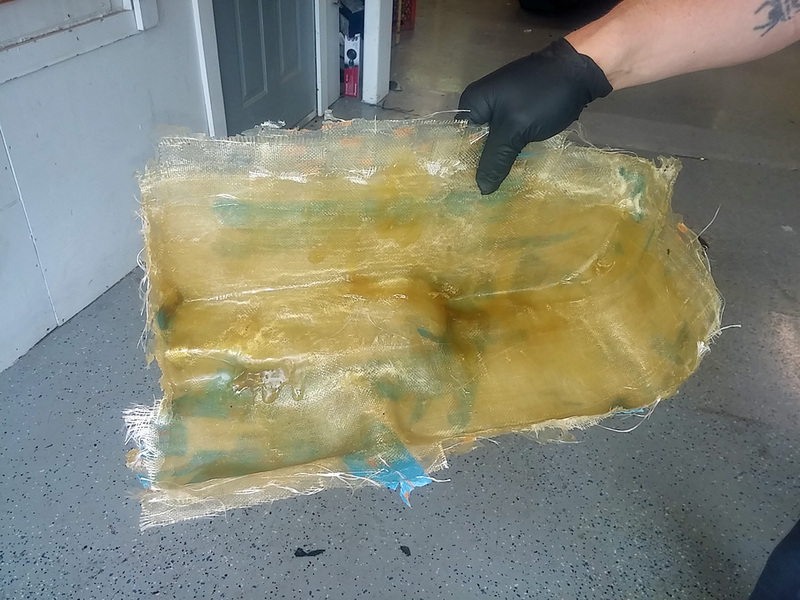 Fiberglass piece for lower and back edge removed in preparation to build the rest of the enclosure. 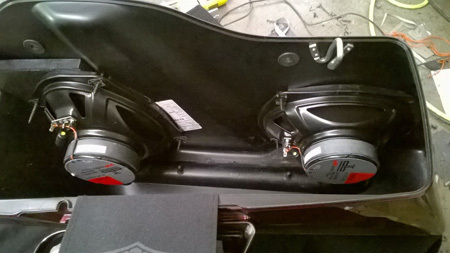 Trimmed back and rear edge with speaker ring and supports test fitted in hard bag. 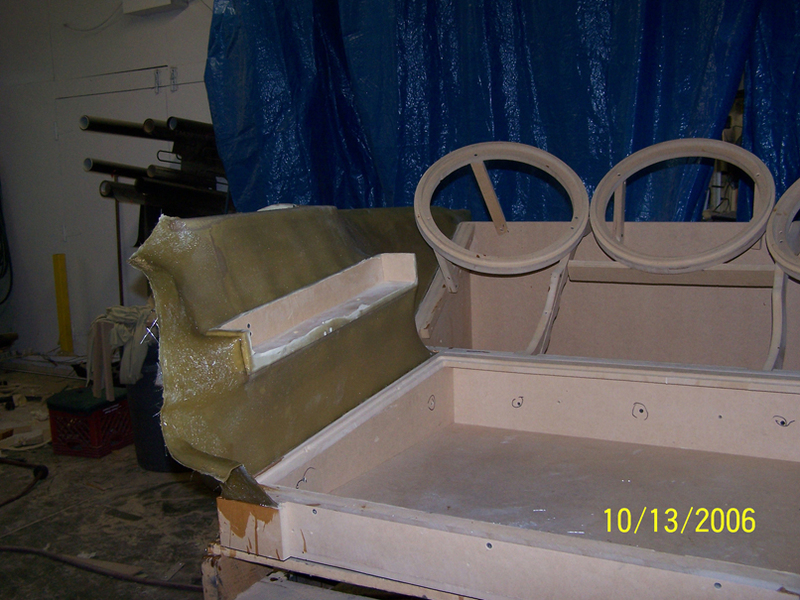 Enclosure wrapped in fleece awaiting fiberglass resin. 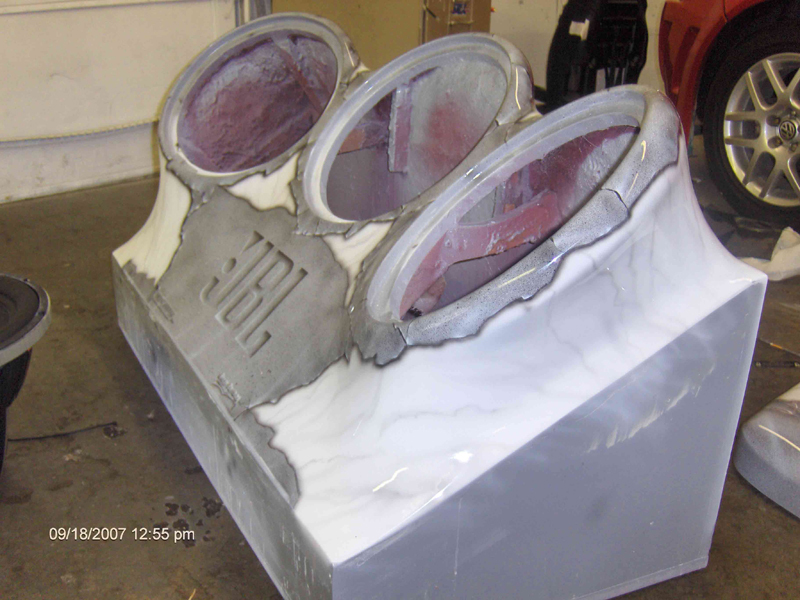 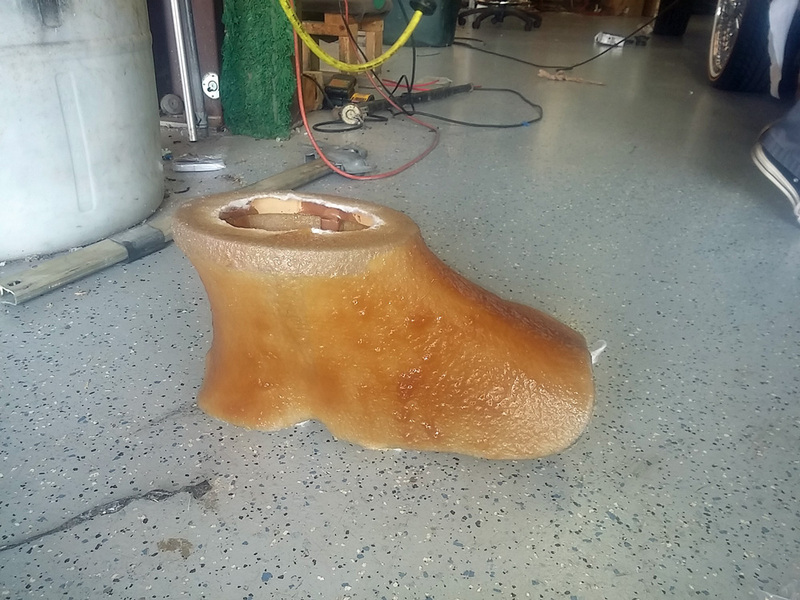 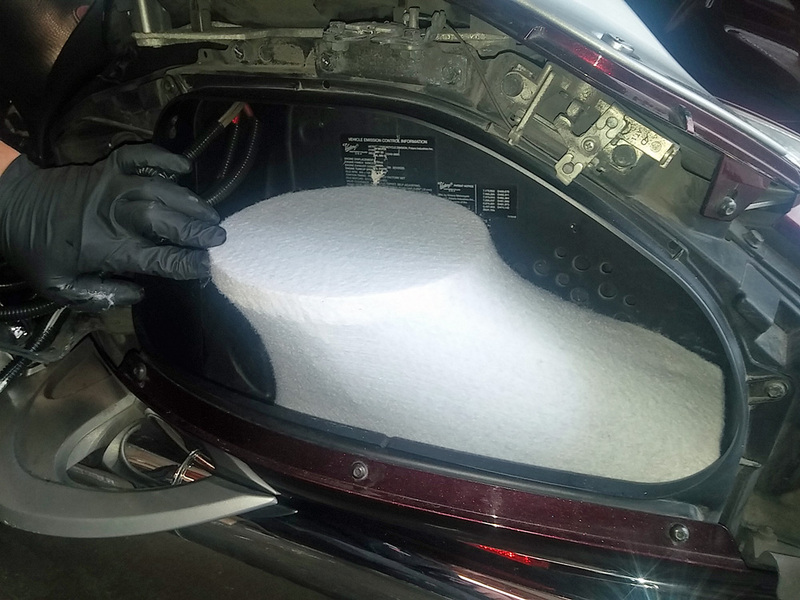 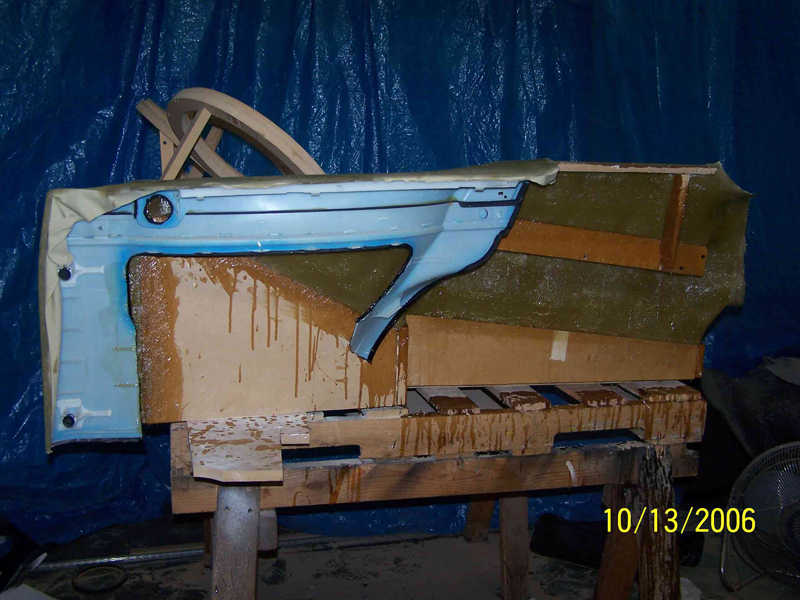 Enclosure after coating with fiberglass resin and allowing to set up and harden. 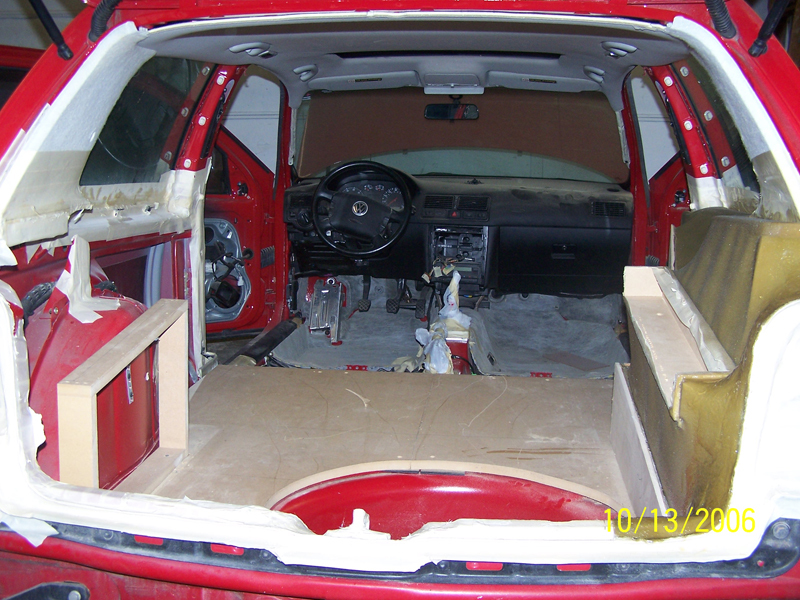 Enclosure after sanding and awaiting pad and vinyl wrapping. 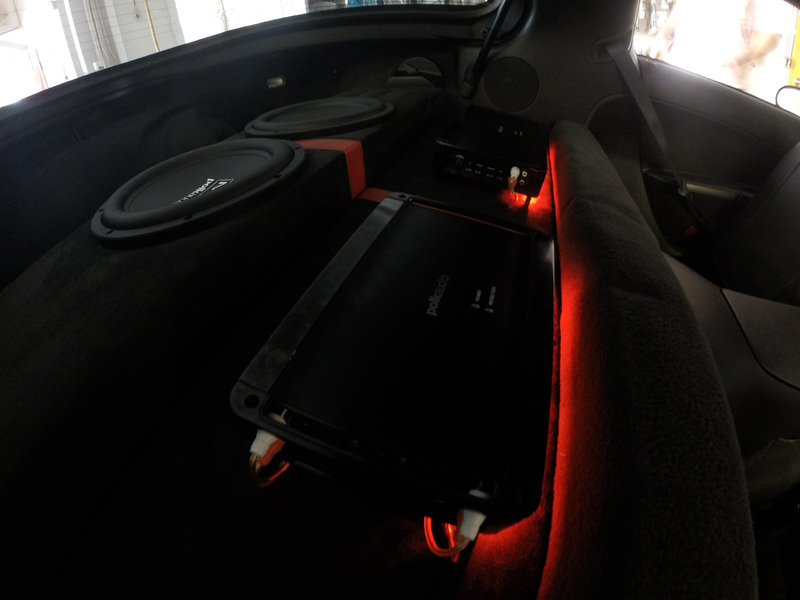 Custom LED lighting underneath amps. 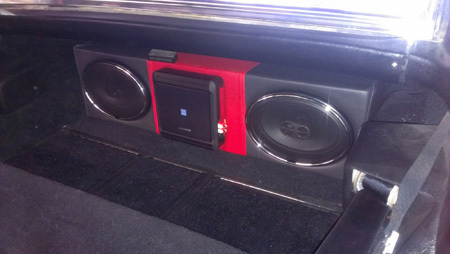 Custom amp rack and sub enclosure wrapped in suede and red trim stripe. 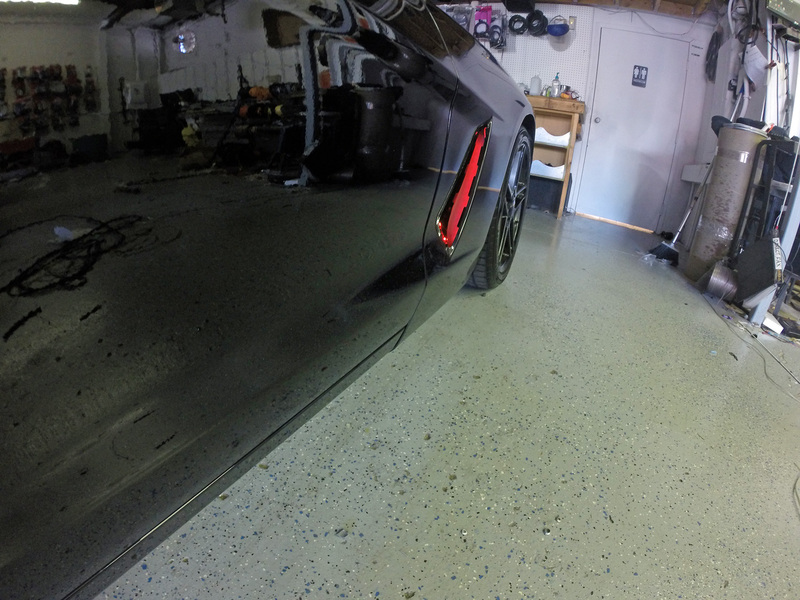 Different shot in lower level lighting. 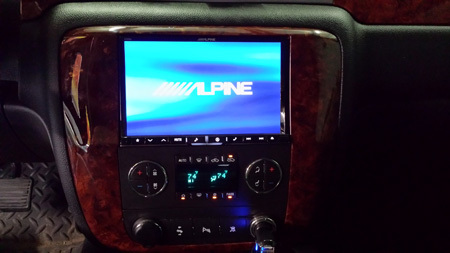 Alpine X008U Audio/Video/Navigation unit installed in a 2010 F250. 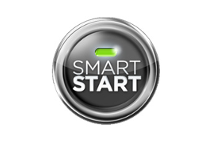 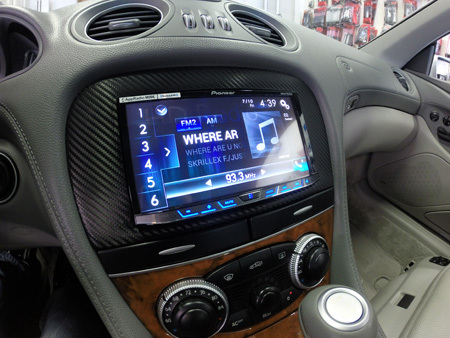 The ADS Maestro allows full integration of unit in vehicle including TPS sensors check engine codes and retrieval, maintaining of factory satellite radio and more. 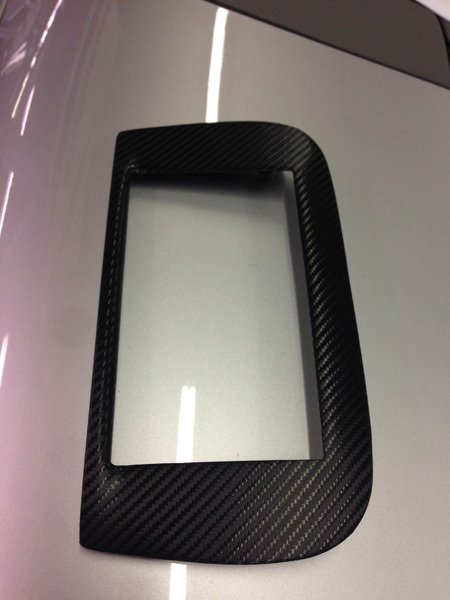 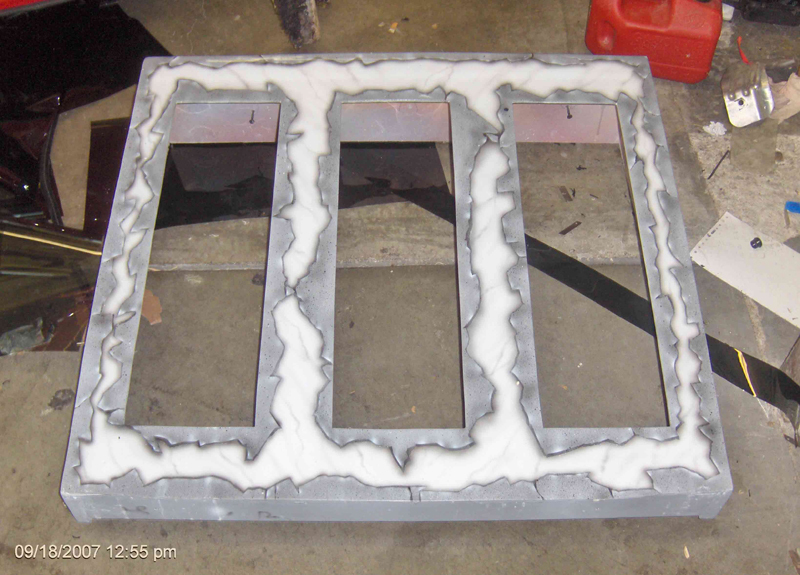 What a great looking dash this turned out like after we worked our magic on it. 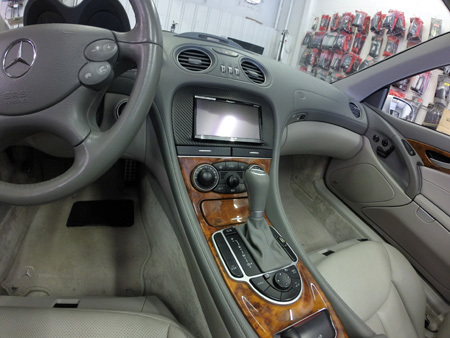 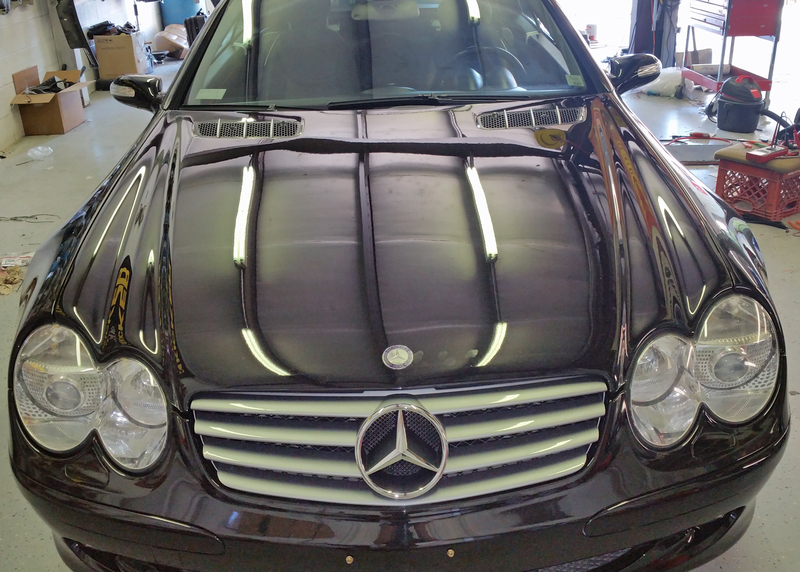 The factory Navigation had given up the ghost on this 2006 Mercedes SL500 and the customer was searching everywhere for a replacement which is very pricey with these vehicles. 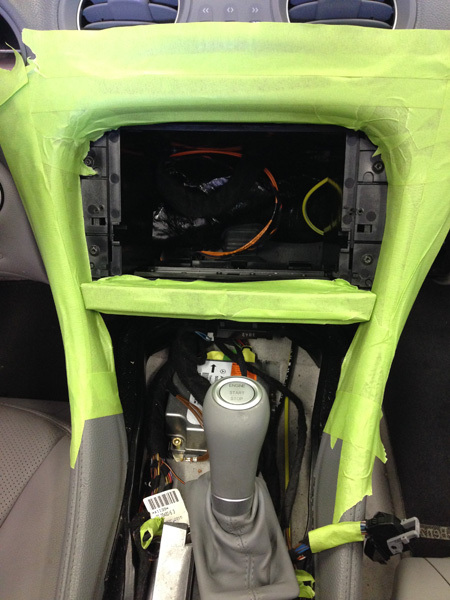 Beginning of the dash fabrication including removing the factory radio, tuner pack, amplifier and changer and masking off area around factory radio opening. 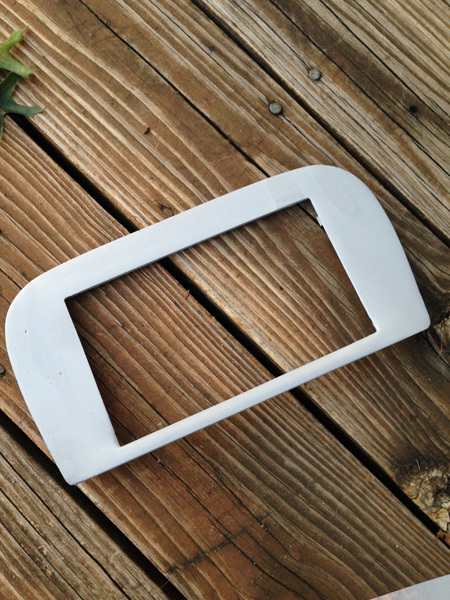 Custom fabricated trim and mount after initial mockup. 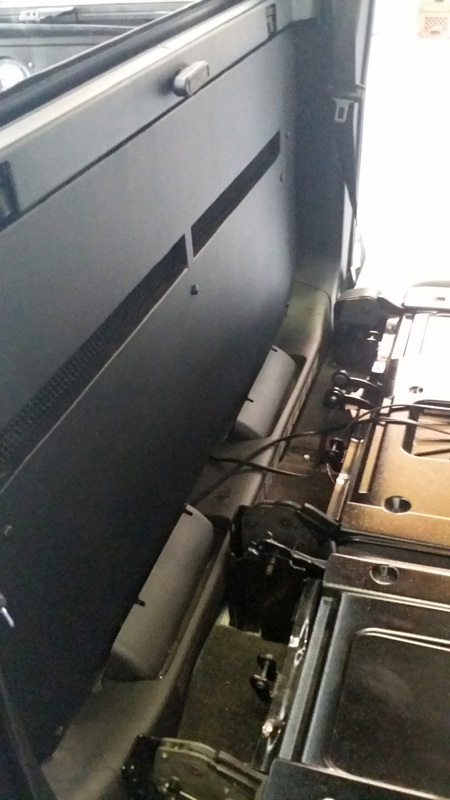 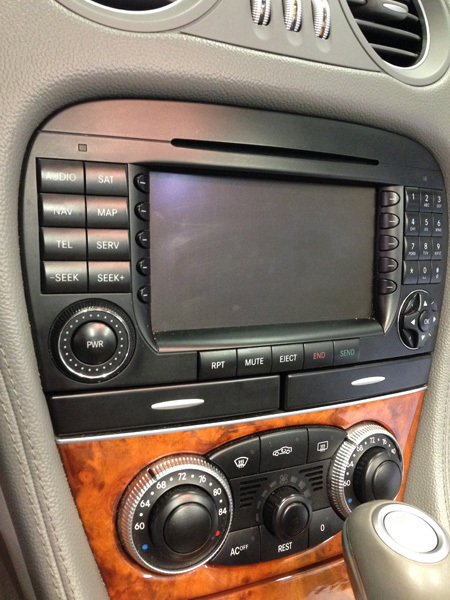 X009U 9-inch Audio/Video/Navigation Receiver installed in a 2012 GMC Truck. 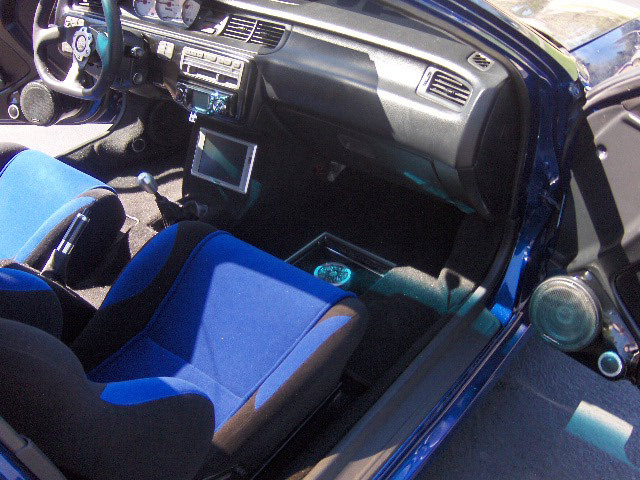 Wow what a difference this makes in the whole look of the interior and the functionality is out of this world compared to how little the factory unit does. 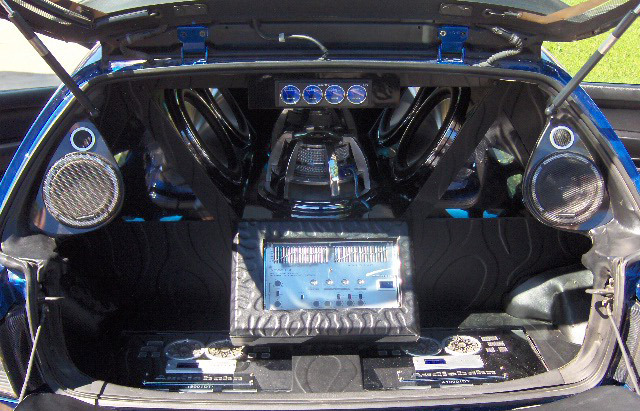 Beautiful custom wrapped box with a single Alpine 12″ in the top and 6×9’s in the front powered by an Alpine amp in the rear of a classic Corvette. 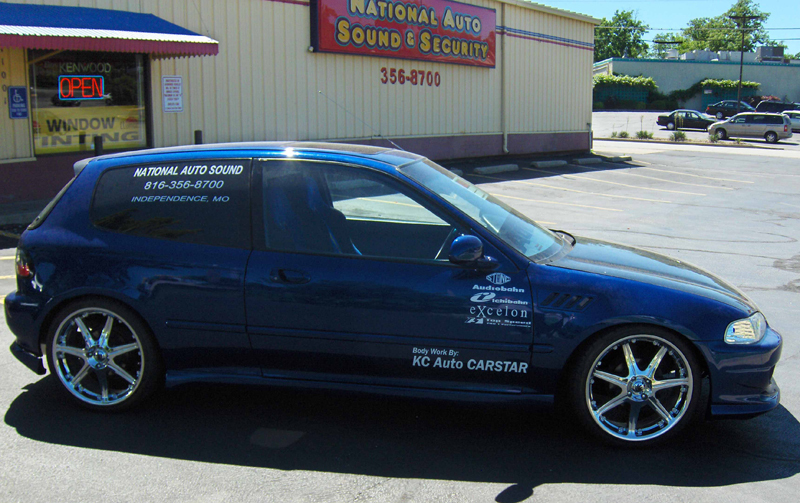 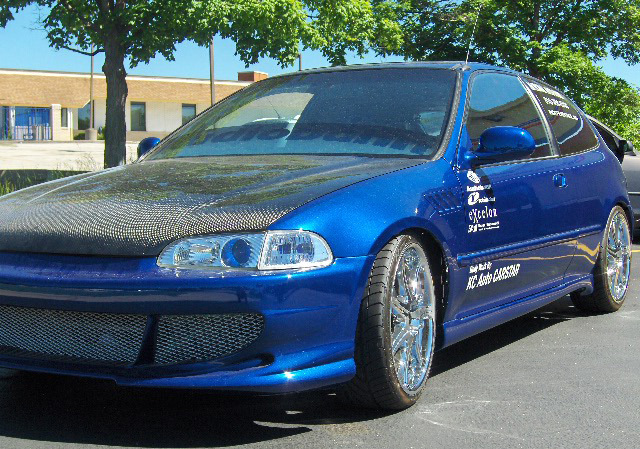 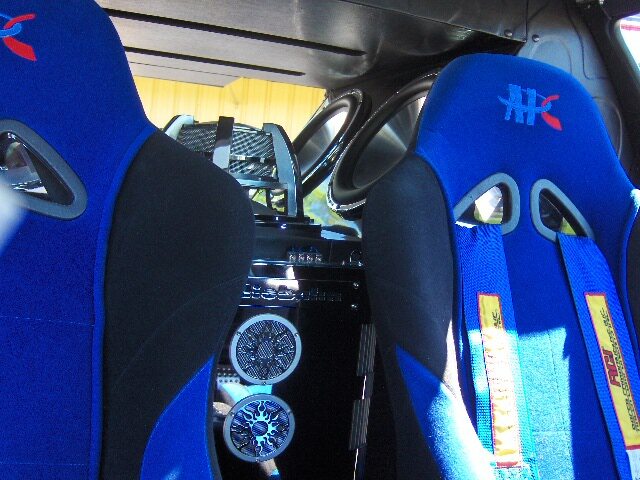 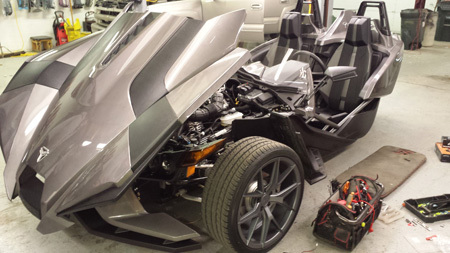 Rene is the upholstery expert for custom car audio installs. 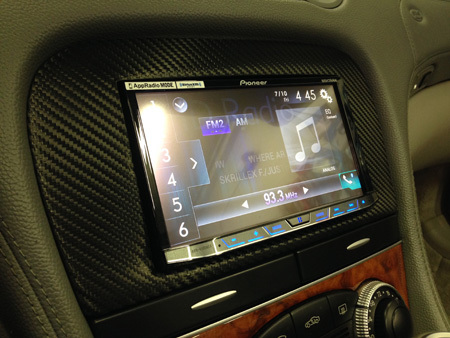 Alpine X008U 8-inch Audio/Video/Navigation receiver installed in a 2012 Escape with full ADS Maestro controls. 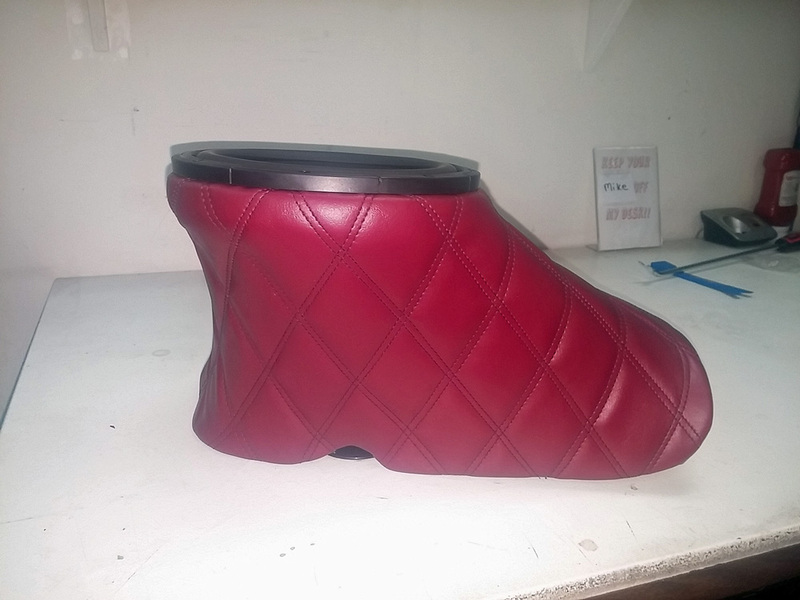 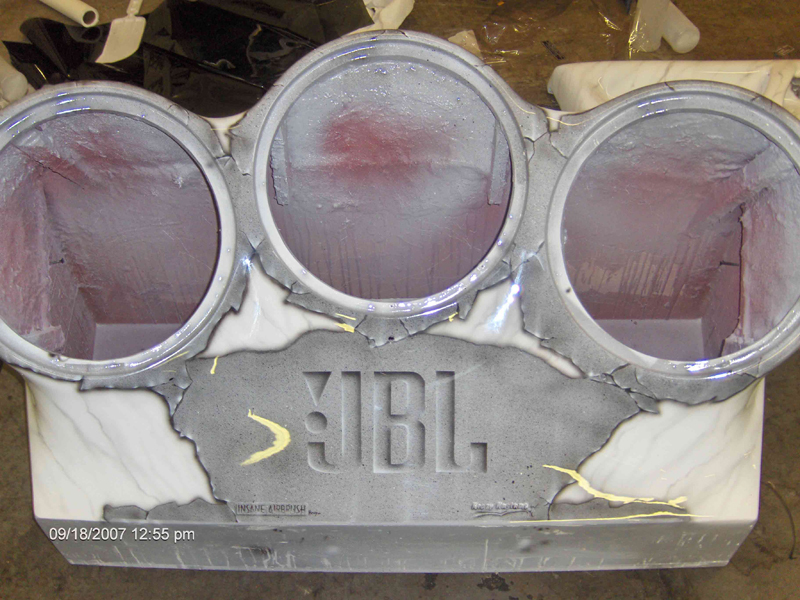 Front custom cover and meshing for turbo box passing through into the bed of the Cadillac Escalade ext. 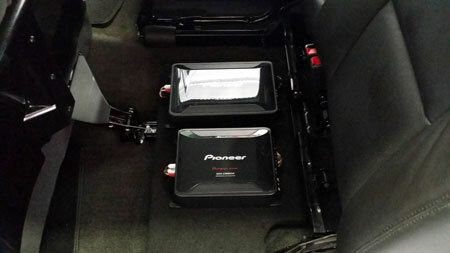 Both Pioneer champion series amplifiers installed in Escalade ext. 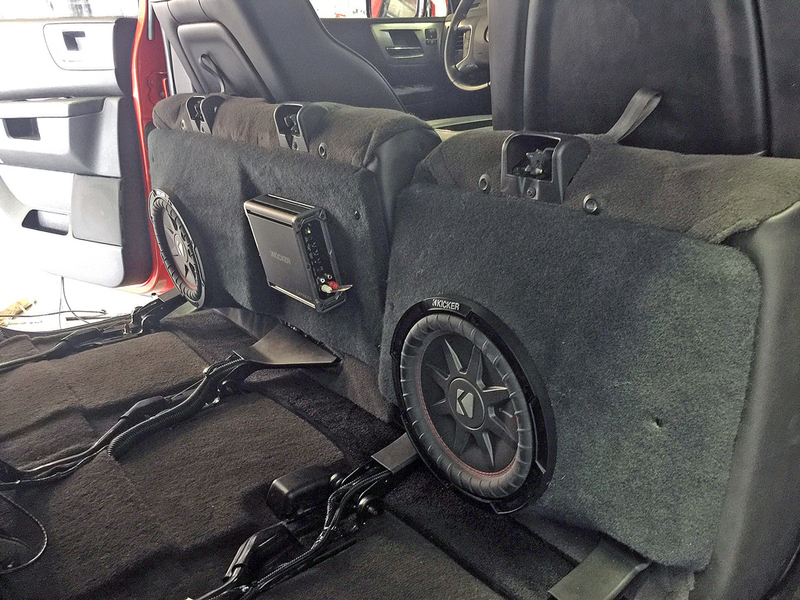 Interior shot of the Turbo style box made for two Pioneer champion series Pro 12″ subwoofers. 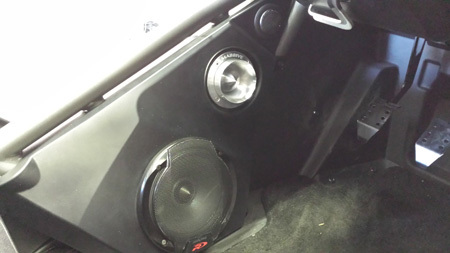 Exterior shot of the Turbo style box made for two Pioneer champion series Pro 12″ subwoofers. 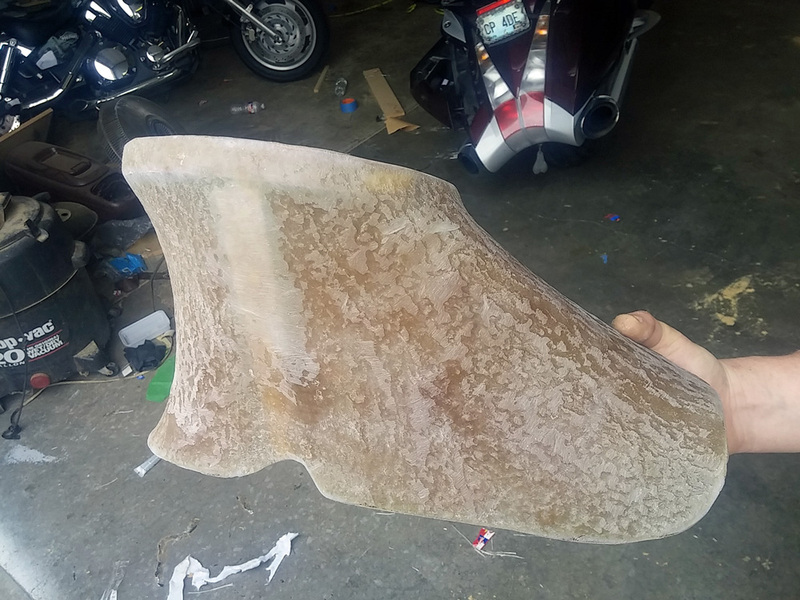 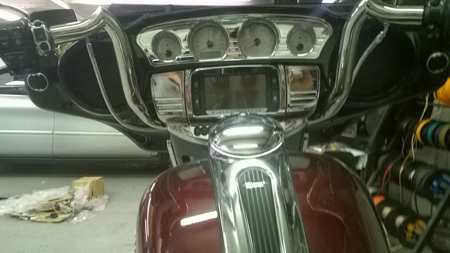 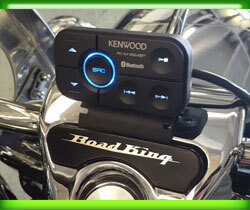 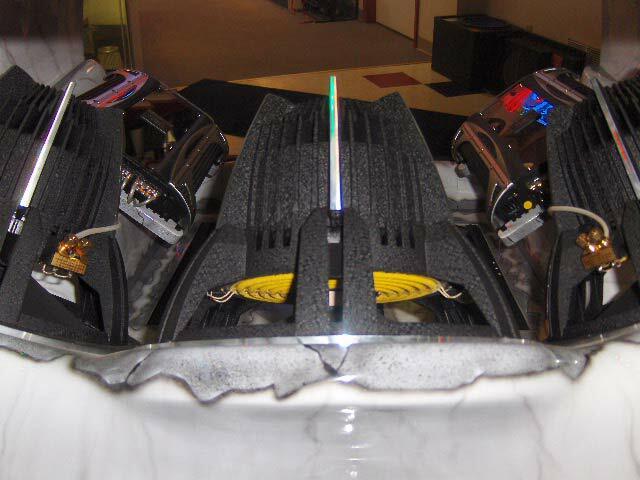 Polk Audio Component 6.5″ and Tweeters installed in fairing on Harley Davidson. 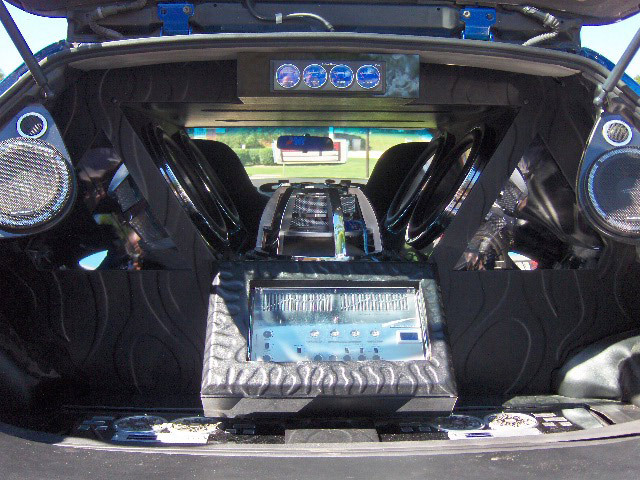 Polk Audio 6×9’s custom installed into rear saddlebags. 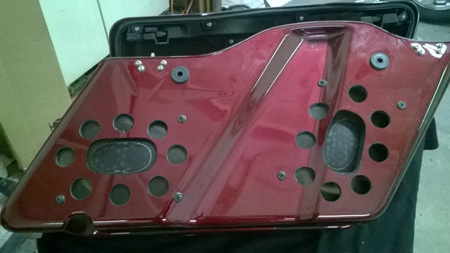 Photo showing custom drilled holes for Polk Audio 6×9’s to play through in the inside of saddlebags. 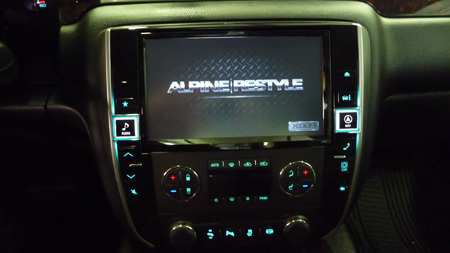 Alpine X008U 8″ Audio/Video/Navigation Receiver in a 2012 Silverado. 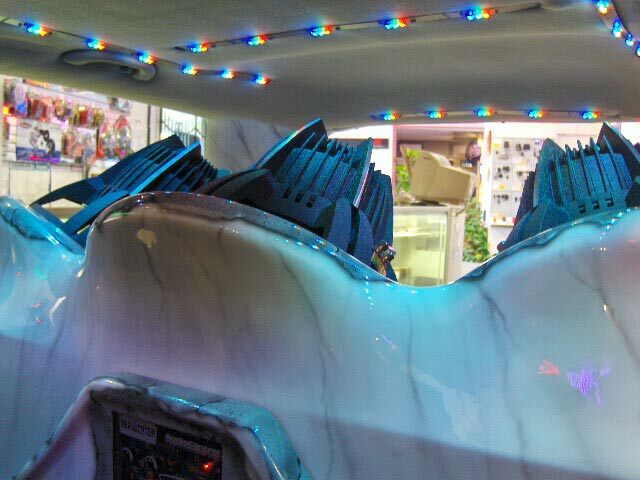 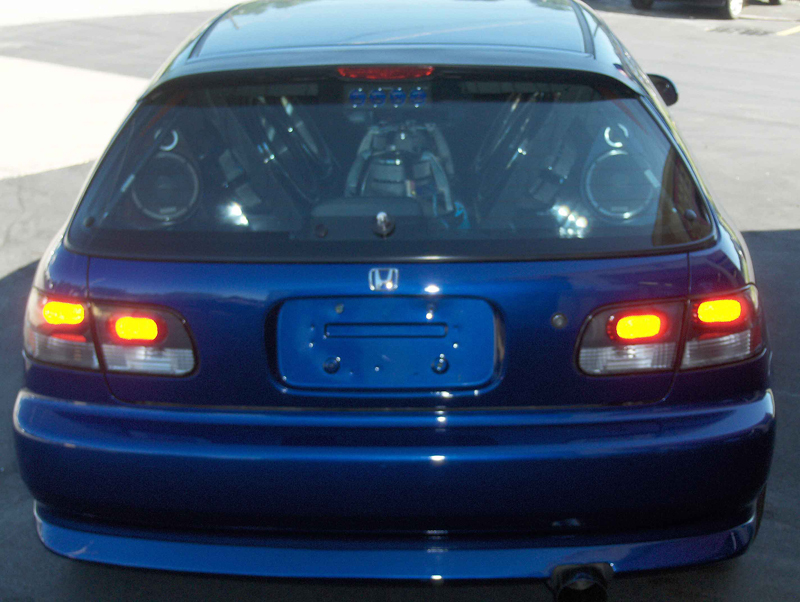 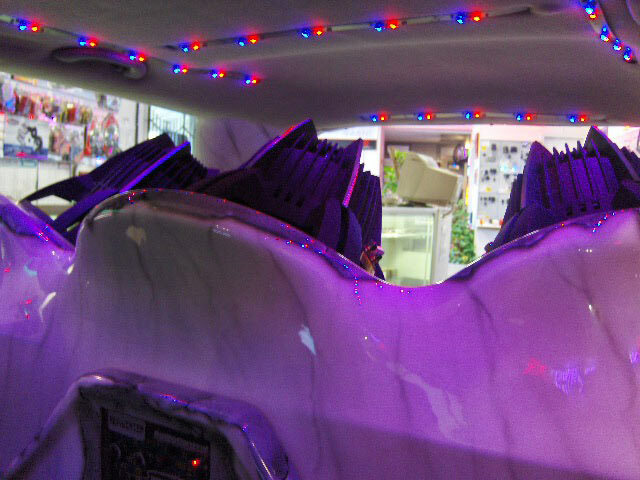 Custom enclosure in rear of honda accord finished in multi-colored vinyl wrapping and custom LED lighting.